This car was filling at my friend's CNG station in Lala Musa. The owner of the car owns 5 CNG Station in Rawalpindi. Does 90 Kms in one cylinder. It reminds me of the post that showed a Land Cruiser getting filled with CNG at a station. Why cant he drive it on Petrol/Diesel when he can afford that expensive car. And by the way if the car owner owns 5 stations, it is even more ridiculous 2 get ur car filled with CNG.Wahan ke employees kya sochenge ke Seth saab bhi CNG bharwane aate hain! @ hondafunda : Well said! What I feel is simply pity for this guy, but in the end it is his own choice of fuel. But even if this Prado is bought on lease, one who can afford such a huge monthly installment, can surely manage it on petrol. And finally the old saying. Everyone can buy and elephant, but not everyone can feed it. Chamri jai par damri na jai is another proverb for this situation. :S, yeah its his car, but still he shudnt have done this to it!!! 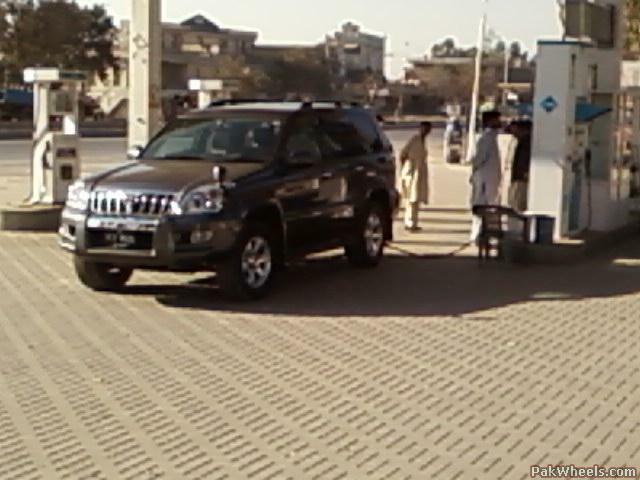 @hamdani, IF i get my prado, i'll surely be running it on DIESEL PoweR!!!
" yeah its his car, but still he shudnt have done this to it!"